Using cloud storage services is easy, but comes with its own security challenges. Do you know where your data is going? You store those files somewhere in the cloud. Cloud storage providers have full access to your data and control where it is stored. You don't have much information about the infrastructure and the security mechanisms in place. And it might be that this storage isn't in your country, which could cause legal concerns. Sharing data everywhere has never been easier. The cloud allows you to have your files always there when you need them, no matter where you are. Upload your data to the cloud and access it from anywhere, even from your smart phone or tablet. And easily share with colleagues or partners. Do you remain in control over your data? Can you rely on your cloud provider? What are the consequences of a data breach? What is the chance of leakage, and can you check the data's security? Cloud storage allows you to store your data online. And, you can access it from anywhere and from any device (PCs, laptops, tablets, smartphones, etc.). SafeGuard Encryption for Cloud Storage protects your data in the cloud. You stay in control of the encryption keys. And only people with those keys can access your valuable data. Securely share your confidential data with your team members. You can even share with third-parties without compromising on security. Perform encryption transparently and in the background. Allow your users to work without interruption. Delivers security with proven data encryption algorithms for the best security and performance. Get industry-certified encryption that's already protecting millions of computers and devices in businesses like yours. Get transparent encryption to cloud storage providers like Dropbox, Skydrive and Egnyte and be extensible to other cloud services. You keep control of your encryption keys. And you don't need to rely on the security architecture of the cloud storage provider. Gives you the benefits of cloud computing while securing your data. Uses strong, standardized encryption algorithms that are secure and fast. Allows only authorized users to access encrypted documents. Provides support for AES-NI hardware-based encryption with latest Intel i5 and i7 processors. Our central-management console means you can always recover encrypted documents. We make it easy for your users to share the information they need to do their jobs, while you comply with regulations and prevent data breaches. Lets users share encrypted data within or across the organization by using shared keys in their key ring. Ensures secure collaboration with external parties without compromising on security. Includes a portable application to access encrypted data from a device where no SafeGuard Enterprise client is installed. Use our SafeGuard Management Center to install and manage Encryption of Cloud Storage across your entire network. Provides you with comprehensive data security when used with other Sophos SafeGuard Enterprise modules. Enforce your rules for encryption, authentication, user privileges, individuals, groups and devices. Gives you audit logs and reports so you can easily document compliance with internal policies and external regulations. Centralizes key management for data recovery and document sharing. Use the same key management you do for other SafeGuard Enterprise modules. Sets central policies to protect files saved to the cloud. 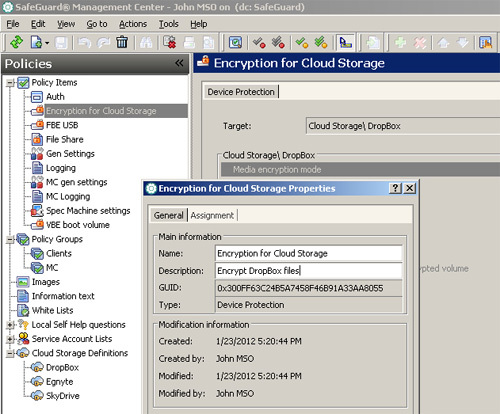 Download the Sophos SafeGuard Encryption for Cloud Storage Data Sheet (PDF).